You are here > Home>Latest News>All in a Day’s work! We are delighted to welcome our newest recruit, Callum Day, the latest addition to our team in the steel tank workshop. 18 year old Callum joined Tuffa UK as a welder in February this year. He had previously worked as a fabricator at a local engineering firm for 5 months. Prior to that, he gained a BTEC Level 3 Business (Triple) from Stoke-on-Trent 6th Form College, before studying Engineering at Burton & South Derbyshire College. Callum is keen to continue his training while working at Tuffa and is hoping to begin a 5 year apprenticeship as a Coded Welder this September. Callum is happy to be working in our steel workshop and is enjoying his new job. “Joining Tuffa is the best decision I’ve made,” he said. 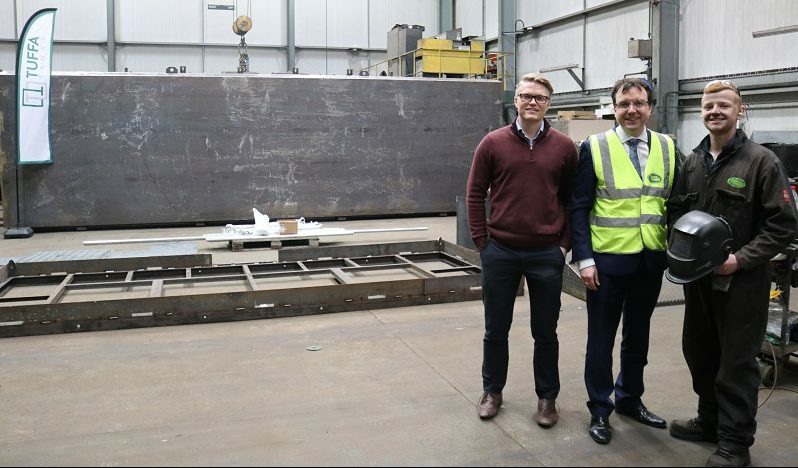 “I’ve only been here a couple of months but I’ve learned so much and had some great experiences, like meeting Andrew Griffiths, our local MP and Minister for Small Business. All in a Day’s work! 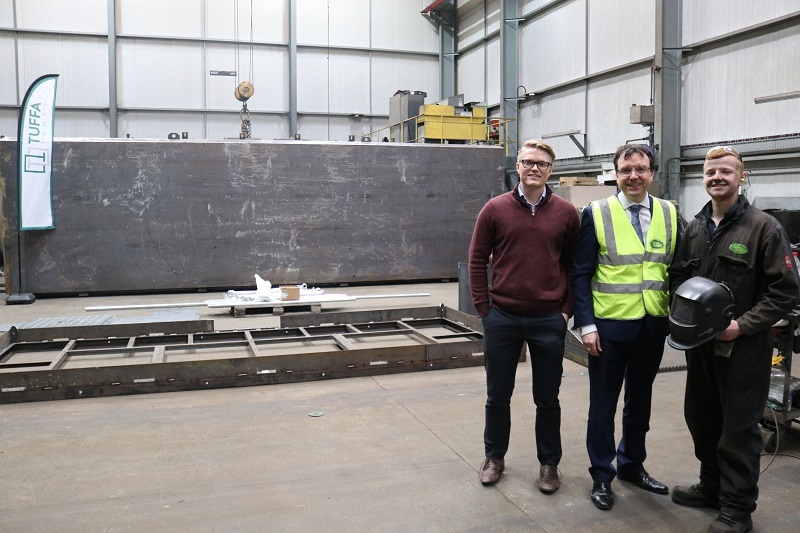 Callum Day, right, and General Manager, James Shenton , left, with Andrew Griffiths MP, Minister for Small Business during a recent visit to Tuffa UK. “I enjoy working as part of a team and helping to build the big steel tanks. I feel like I’m trusted here and the rest of the guys in the workshop can help me when I need it, but they also encourage me to work on my own,” he added. Factory Manager, Jason Shenton is pleased with the start Callum has made. “He’s settled in really well and is a quick learner. He’s shown us that he is a skilled welder and he is a valued member of our steel workshop team,” he said.